I recently purchased some stamp sets from a friend of mine who is a consultant for CTMH and when I saw the theme on the WICKED WEDNESDAY ATC CHALLENGE BLOG this week was "things with wings" I knew it was the prefect chance to try out one of the stamps I bought. I started with a piece of kraft paper on the ATC back and inked it up with gathered twigs distress stain. I added a small piece of burlap, some gold / honey coloured mesh bling﻿ and coloured the image with Tim Holtz distress markers. I used the gathered twigs distress stain to colour around the edges of the image as well to give it more of a vintage-y look. 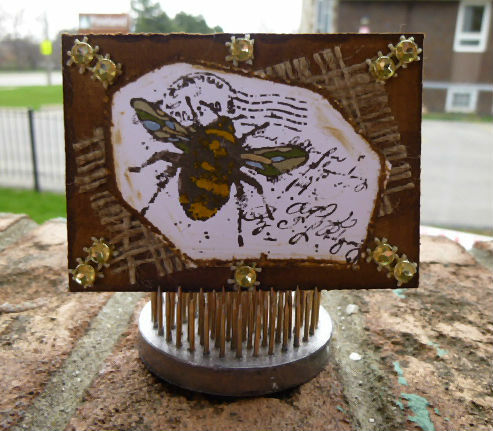 This looks great - love the bee & embellishments! Absolutely fabulous creation Donna! I LOVE that stamp, usually you see good images of bees really small, but that actually has presence! So glad that you joined us at Wicked Wednesday - your friend was absolutely right, it was perfect!